After Google announced that Browser Sync will no longer be updated and will stop working at the end of the year, many people looked for an alternative. The closest project to Browser Sync is Mozilla Weave, a Firefox extension that synchronizes local data from your browser with a server so you can access your data from multiple computers. Unfortunately, Weave is still an experimental prototype, so it can be buggy and unreliable. Weave 0.2 has been released today and it supports new data types: cookies, passwords, saved form data and sessions, in addition to bookmarks and browsing history. After installing the extension and restarting Firefox, you need to create an account and enter a key used for encryption. Unlike Browser Sync, Weave doesn't synchronizes data in real-time. "After the initial data transfer is completed during setup, Weave connects to the server periodically when it accumulates enough changes that need syncing or when enough time has passed since the last sync (at least once every 20 minutes if any data has changed). 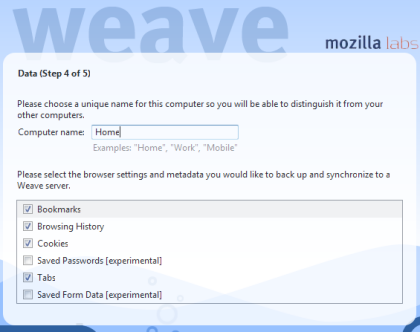 Weave also syncs when you start Firefox, when you quit it, and when you click on the "Sync Now" button in the Weave menu or the preferences." It's worth mentioning that browser data sync is just one of the components that will be included in Weave. "As the Web continues to evolve and more of our lives move online, we believe that Web browsers like Firefox can and should do more to broker rich experiences while increasing user control over their data and personal information. Weave is the Mozilla Labs' project to develop a coherent framework and platform for deeply integrating online services with the browser." Opera users can already synchronize bookmarks and notes using a feature included in the latest version of the browser. If you only need to synchronize your bookmarks, migrate to an online bookmarking service like del.icio.us, Google Bookmarks, or install plug-ins like Foxmarks (Firefox), Zinmko (Firefox / IE), that synchronize bookmarks and provide a web interface where you can access and share your bookmarks. Google Bookmarks Button supports FF3. And the upgraded Weave has some problems with passphreses - account created on WinXP doesn't work on Mac OS X. And yes, Browser Sync has been open sourced, thank to Google, but it seems to late, unless Weave 0.2 features too many bugs. Its great...waiting for web interface to at least view my bookmarks. Too bad that (for now) Weave doesn't work on 64bit Linux :/ Or maybe it is just 64bit FF. caschy: Actually, it can sync to your own website, as long as you're using WebDAV. Check out the Preferences dialog, notably "Server Location". I'm telling you dude, one day Google is going to take over the World. Looks like the Mozilla Labs website is down from all the people trying out Weave.